We love shrimp tacos! We used to get them all the time at one of our favorite local restaurants called Gaslight Grill, but it has been shut down since last fall to relocate. It was torture until I realized I could just make shrimp tacos at home. Not sure why I didn’t come to this realization faster. 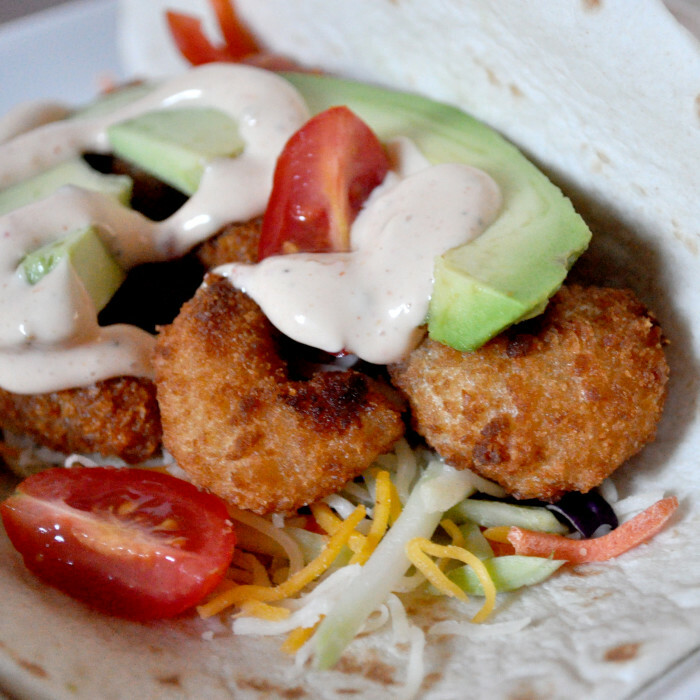 These Crispy Shrimp Tacos are definitely a “cheat” meal though since I use ready-to-bake popcorn shrimp. It is worth it though: they take less than 15 minutes to prepare and always hit the spot! 1. Preheat oven and put desired amount of popcorn shrimp into the oven to bake. 2. While shrimp are cooking, prepare other items. 3. Heat up tortillas in microwave or in a pan on the stove. 4. Pile the goodies onto your tortilla and enjoy! 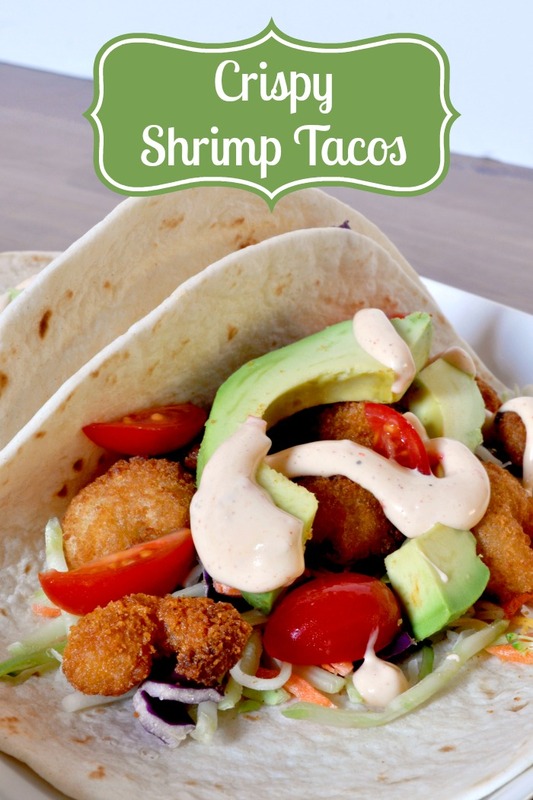 The best part is that when we buy the ingredients for these Crispy Shrimp Tacos, we can get multiple meals out of them over a few week span. It works out really well for us, especially on those days I forget to get anything else out of the freezer. I hope you love them! I would LOVE these! I love fish tacos/shrimp tacos but Grumpy has an aversion. However, that doesn’t stop me when I want them! This would be easy because he could just eat the shrimp without the taco 🙂 Just throw some fries in the oven for him to go with! The boys love tacos, I think they will enjoy the popcorn shrimp. Thanks so much for sharing your recipe. It’s a great summer late lunch. Pinned/shared. This looks FABULOUS! I love the crispy shrimp paired with the soft tortillas!!!! These look fantastic! 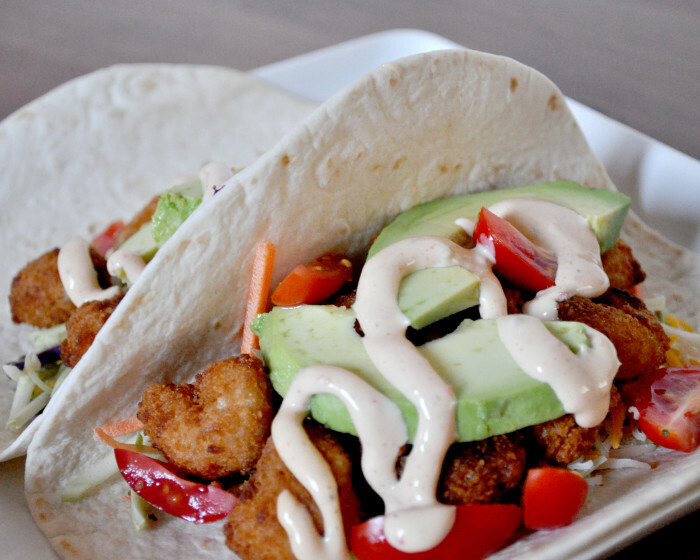 I love fish tacos but have never had shrimp tacos – great idea; thank you for doing this one! Yummy! I’m totally good with a cheat meal every so often and this looks like it’s worth every bite! Love the addition of avocado!